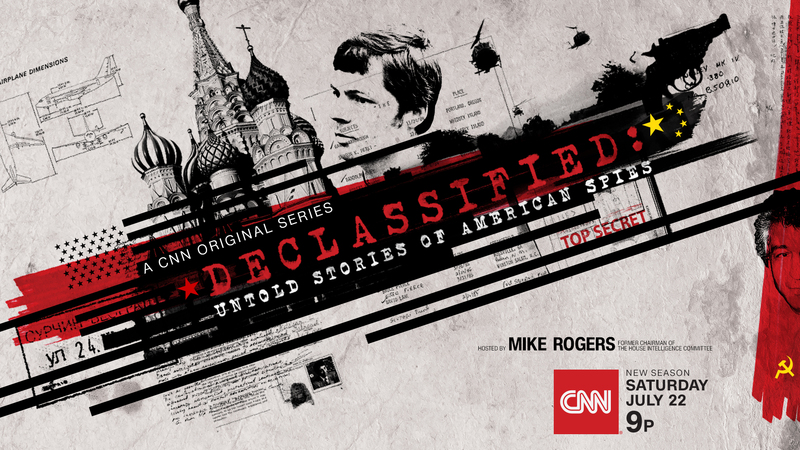 CNN’s Declassified: Untold Stories of American Spies returns for a second season on Saturday, July 22, at 9:00 p.m. ET/PT. The eight-part CNN Original Series provides viewers with unprecedented access to the riveting and secret world of espionage. Hosted by former U.S. Congressman Mike Rogers, also the former chairman of the House Intelligence Committee, each episode features a newly declassified mission told first-hand by the agents who lived it. Intelligence agencies including the CIA, FBI, NSA, DEA, Homeland Security and the State Department are represented, revealing the unbelievable true stories of America’s covert operations in the United States and around the world. In addition to the TV airings, Declassified will stream live for subscribers on July 22 via CNNgo (at www.CNN.com/go and via CNNgo apps for AppleTV, Roku, Amazon Fire and Samsung TV) and on the CNN mobile apps for iOS and Android. The episodes will be available the day after the linear premiere on demand via cable/satellite systems, CNNgo platforms and CNN mobile apps. The hour-long series, regularly airing Saturdays at 9:00 p.m. ET/PT, is produced by All3Media America with Gregory J. Lipstone, Domini Hofmann, Jacob Cohen-Holmes, Aaron Saidman, and Mike Rogers serving as executive producers.